Serve content variations within Dynamic Content with ease using Dynamic Yield’s integration with Persado. Persado’s AI-powered platform generates content variations by identifying language and emotions that drive audiences to take action. Using a unique Persado Feed URL, map variations within your Dynamic Yield Experiences and launch content variations for your personalized campaigns across your web properties directly from the Dynamic Yield platform. 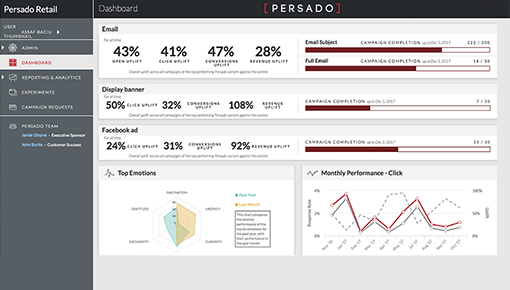 Track pageviews and clicks within Persado using a Pixel to optimize performance in real time. Leverage AI-generated language that best resonates with any audience, segement, or consumer across digital channels. Optimize Dynamic Content with 1-16 variants across channels, from email subject lines to Dynamic Ads. Integrate variations within Dynamic Content using a simple, auto-generated URL from the Persado platform. Use AI-powered content variations in your Facebook Ads to encourage users to your site. Bolster your email marketing by using Persado-powered variations for promotional email subject lines. Expand your segmentation capabilities by leveraging VisualDNA’s psychographic audience data and profiling services to target niche audiences at scale.